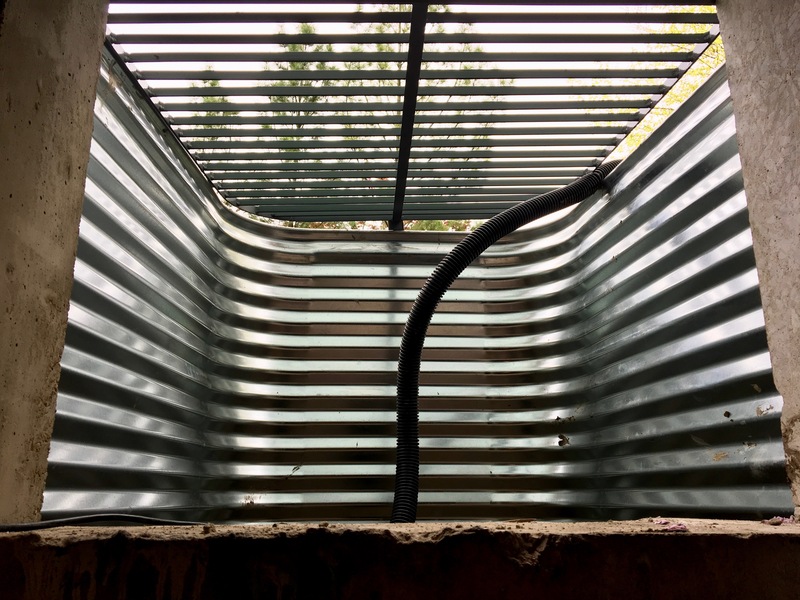 After the latest flood, the concrete contractor quickly addressed the window well. You can see below that it was a low point in the yard. Water from the “lake” ran into the window drain, and the sump pump just can’t keep up. 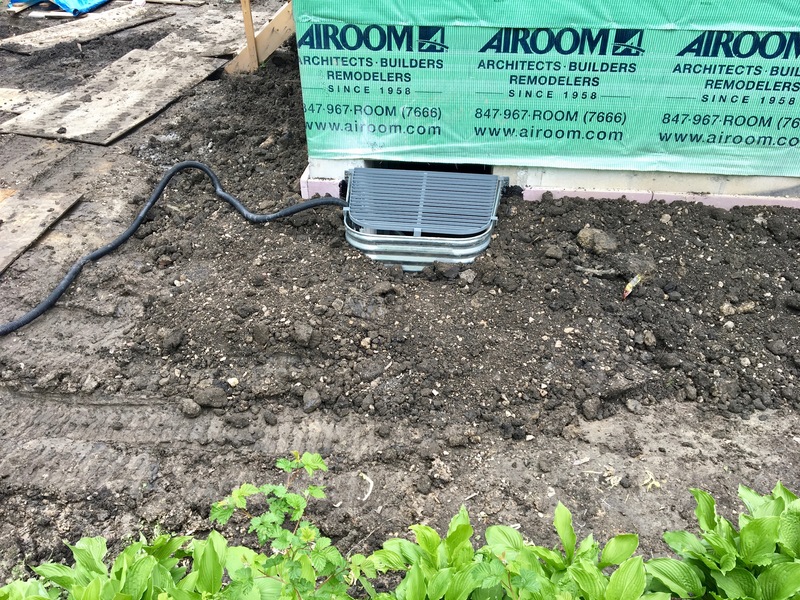 The completed window well, and extra dirt to bring the grade up and push water away from the house. The pipe is a temporary emergency sump pump we put in the window well just in case. 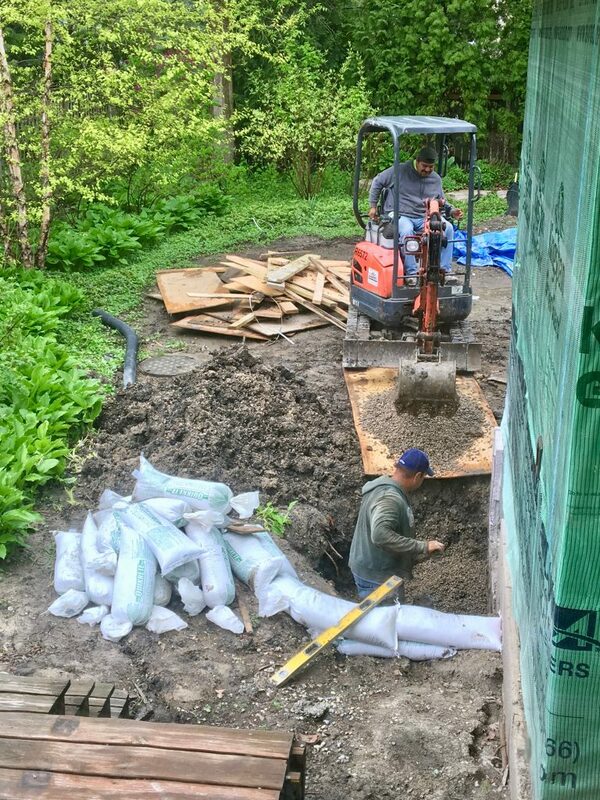 The concrete contractor brought some extra dirt to try to improve the grade of the yard as well. You can see it sloped down and away from the house. The electrical work is partially complete, and we now have some lights and electricity in the addition. Our garage power has been hooked back up, and a permanent electrical connection has been made to the lift station, replacing the temporary extension cord we had been using. The plumber has completed all of the plumbing and is ready for inspection. 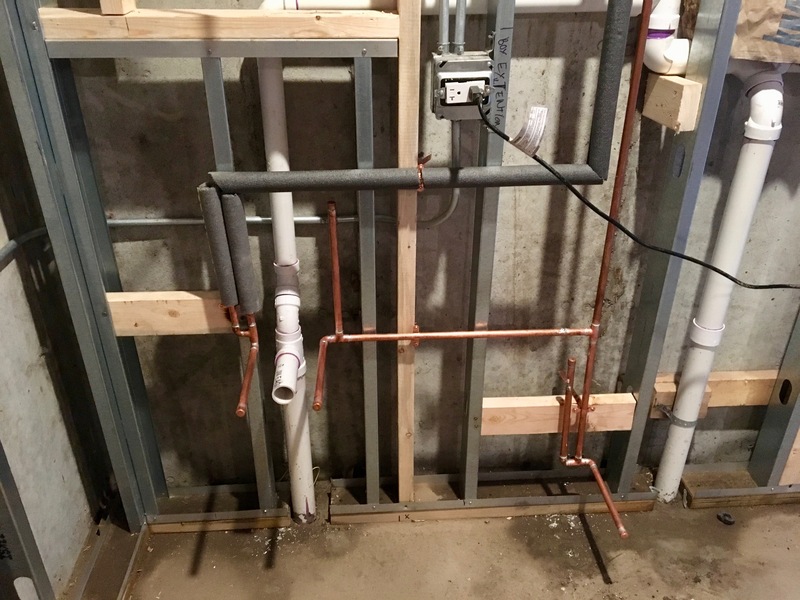 Below is the last of the supply plumbing that was installed for the basement bathroom, and also the pipe insulation. The plumber has also installed the plumbing for the ejector pit. 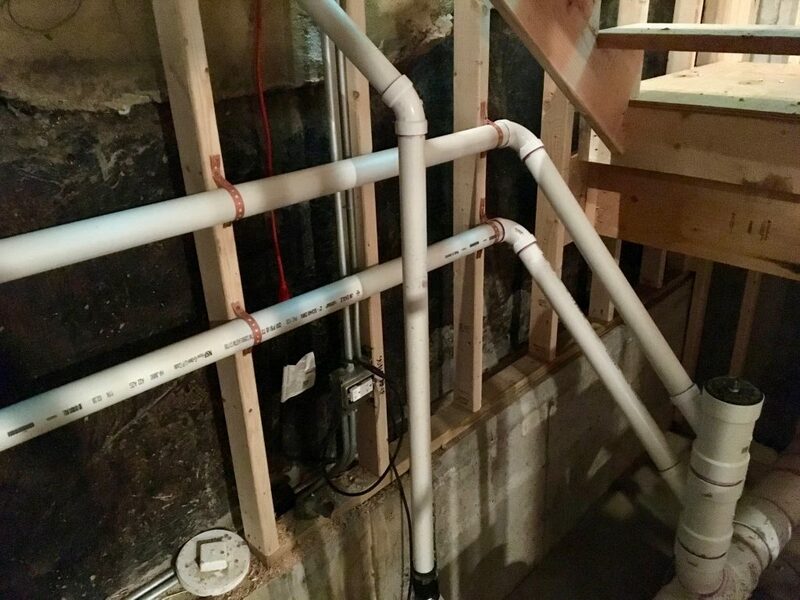 The pipes from the ejector pit are tied into that enormous sewer line in our basement. The roofing should start on Tuesday morning – at long last. 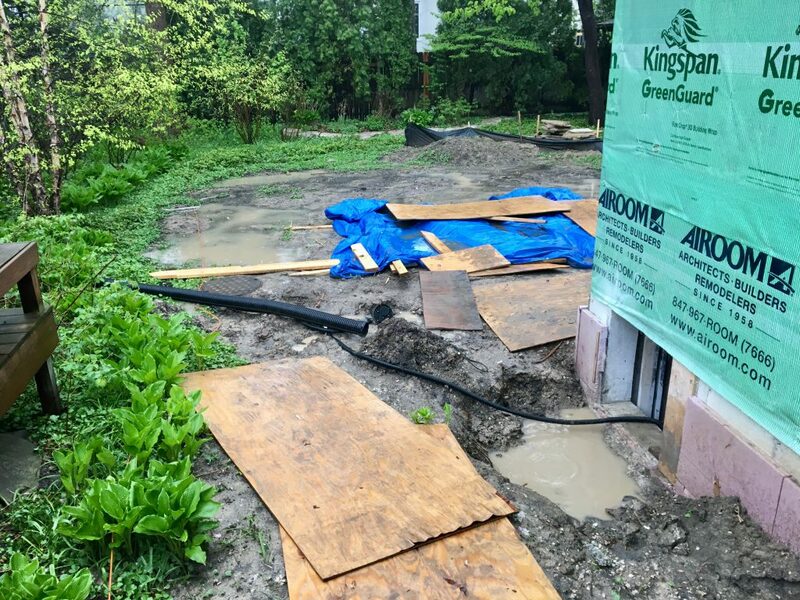 Once the roof and gutters are installed, we should be able to better control all of the water that is coming in, and we will need to come up with a drainage solution. 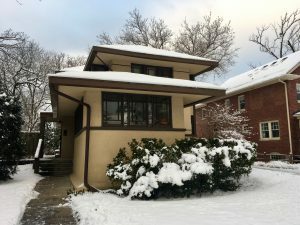 I’ve spoken with the architect and civil engineer, and we are investigating several possibilities. But first, we have to make sure the sump pump works properly. The pump is a Zoeller M98 1/2 hp pump. After lots of googling, I found one possible reason that the pump might have stopped pumping (though it never stopped running): air lock. The manufacturer’s instructions say that a 3/16″ hole must be drilled in the discharge pipe below the check valve. Here is a video of a pump running with water shooting out of the vent hole. My guess is that with all of the churning water and bubbles coming in from massive rain storms, an air bubble formed inside the discharge pipe, and was trapped. The pump impeller was just spinning in an air bubble and not pumping anything. 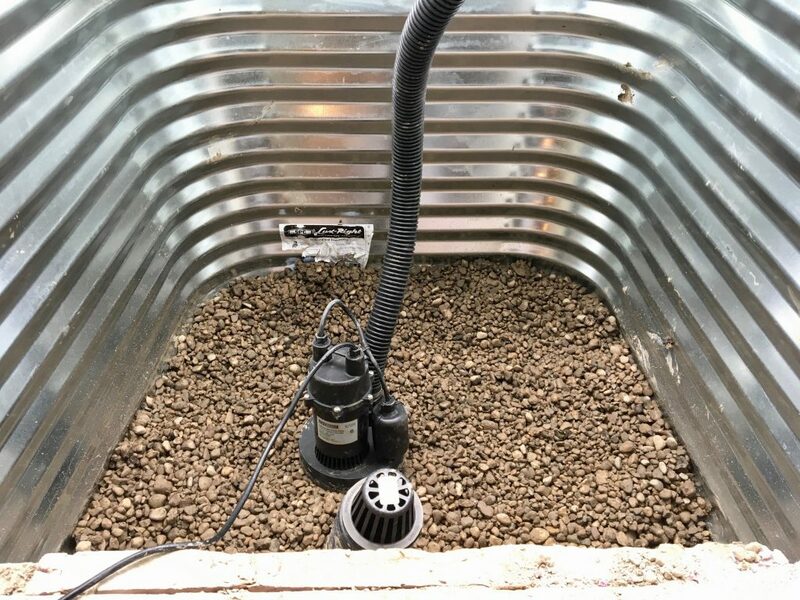 The vent hole allows the water to drain back into the impeller after the pump shuts off, ensuring that the impeller is flooded with water and will pump properly during the next cycle. I’m no plumber, but I can read the instruction manual, so I went and drilled that hole. I’ll see if it makes a difference. However, it is clear that a mechanical solution or additional pumping capacity is not the only solution. Pumps will fail, switches will fail, electricity will fail, battery backups will fail, and generators will fail. 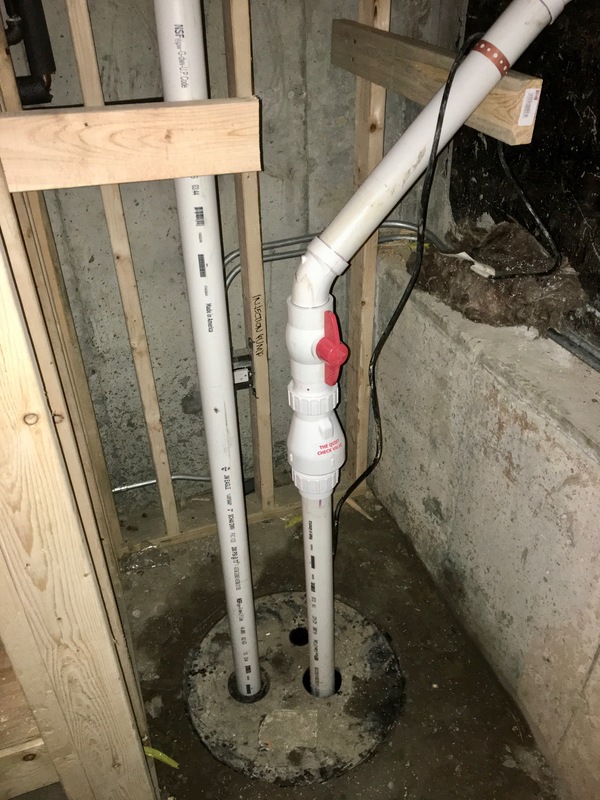 Add an additional, larger sump pump pit with a backup system. 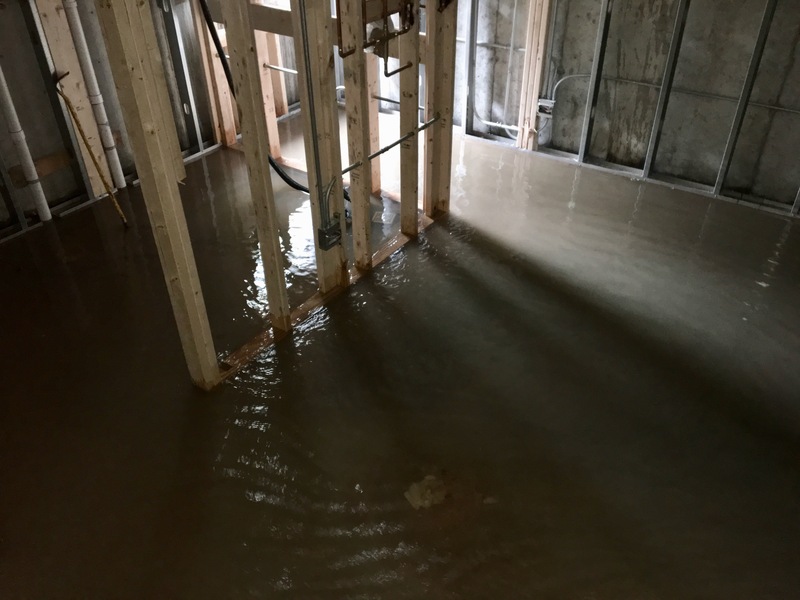 Consider using moisture-resistant materials in the basement finishes in anticipation of it flooding periodically. 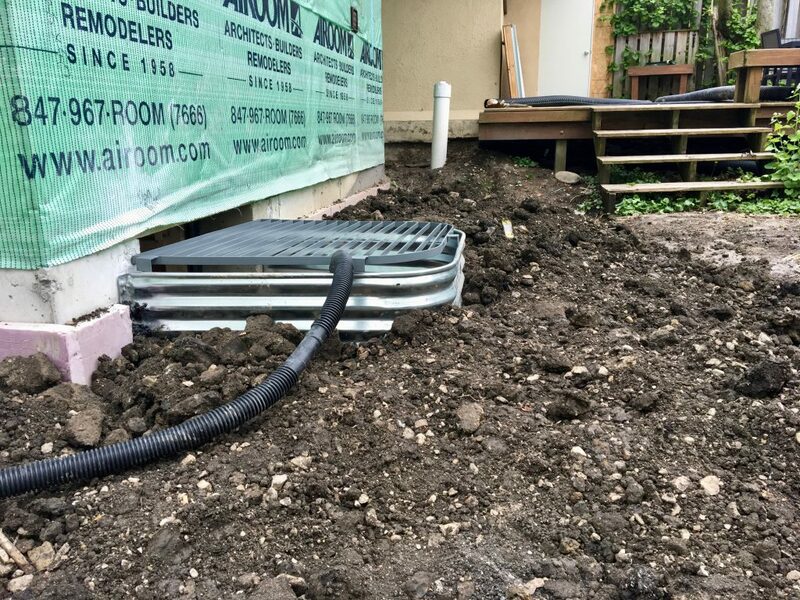 Add a yard drain so that the drain will flow by gravity to the front yard. There is some concern that there is not enough pitch from the back to the front, so this may not be a viable solution. 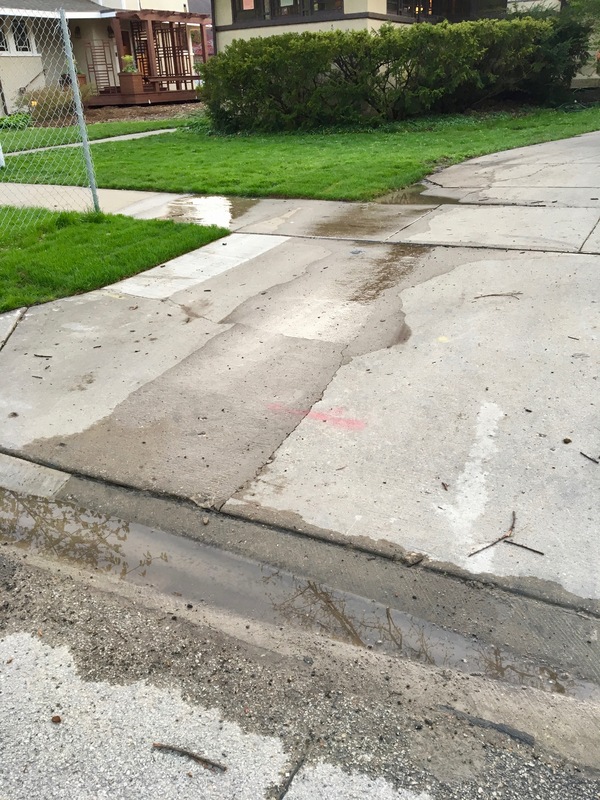 Add a connection to the village storm sewer from a yard drain. 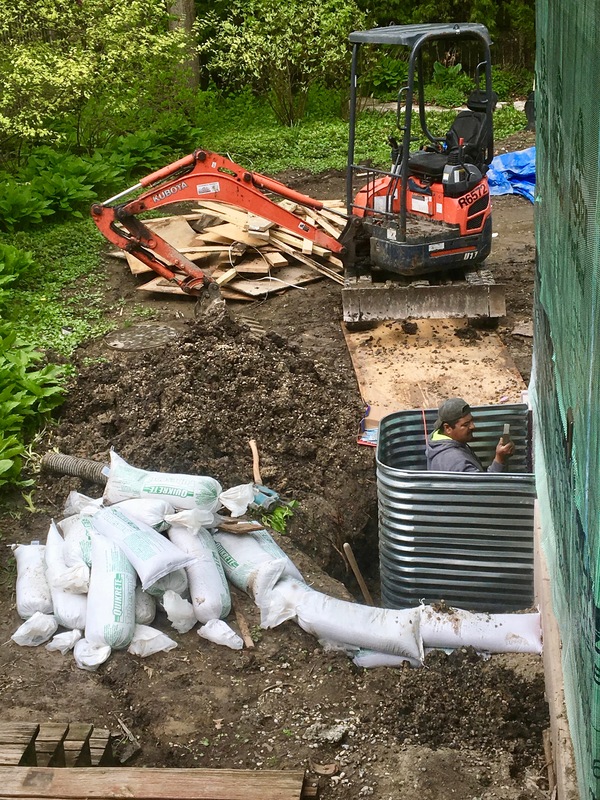 The storm sewer is 6′ deep but is down the street from us, so there would be a lot of directional boring, and this would be a very expensive option. Also, we would need to work with the village to see if the storm sewer has sufficient capacity. The sewer can get overwhelmed and stop admitting water, and our drain would stop working. 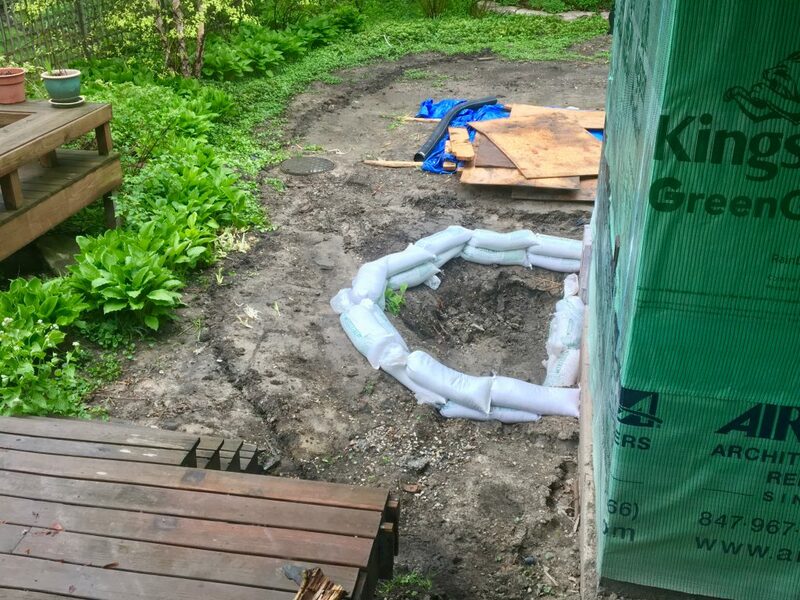 Add a giant man hole to the back yard. This would be 6′ deep and very wide, and would serve as a holding tank for water. Plus we’d put a pump in the bottom of it that would pump to the front yard. In the event of pump failure, there would at least be some capacity for water in the pit before it would be overwhelmed. We’ll need to hire an engineer to work through these options and get our plan approved by the village. With the work on the addition mostly complete, the builder has told us that finishing it should proceed pretty quickly once we have a roof on. Next up: inspections. Then insulation. The windows should be delivered very soon. The stair company will be coming out to measure our stairs for the custom millwork. Drywall. The tile and cabinets for the renovation are sitting in our builder’s warehouse and are ready to install. Previous Previous post: Two steps back?